Advocates for Urban Agriculture (AUA) is pleased to announce that it is has received a Food: Land: Opportunity Initiative grant to develop a technical assistance and certification program, in partnership with the city of Chicago and Chicago farmers. Funded through the Searle Funds at The Chicago Community Trust, Food:Land:Opportunity is a collaboration between Kinship Foundation and The Chicago Community Trust. Since 2002, AUA has represented the collective interests and needs of Chicago area urban farmers through educational resources, hands-on public programming, community outreach, and policy advocacy. With a Board composed of urban agriculture professionals and local food system leaders, AUA became an independent 501(c)3 non-profit organization in 2016. The organization has more than 2,000 individual and organizational members, support from multiple Chicago-area philanthropies, and services designed to help Chicago develop a strong, sustainable and inclusive food system based on local production and value. The new technical assistance and certification program is a multi-year initiative designed to answer the request by many farmers – both start-up and in operation — for subject area training and support in building their marketplace viability. The AUA program will address these needs through peer mentorship, customized workshops, and through a voluntary certification program that establishes best practices around soil remediation, food safety, sustainable growing practices, and community engagement. Year One goals of the grant are to hire a Training Programs Manager, convene a working group of peer farmers who will advise AUA on program structure and farmer engagement, and initiate training classes and development of the certification program. Workshops and certificates will be based on existing best practices and standards as well as local, county and state licensing and regulations. Research will ensure that the certifications include standards important across the spectrum of farm products and buyers: for those growing for retail sale, wholesale to institutional buyers, as well as value-added products. 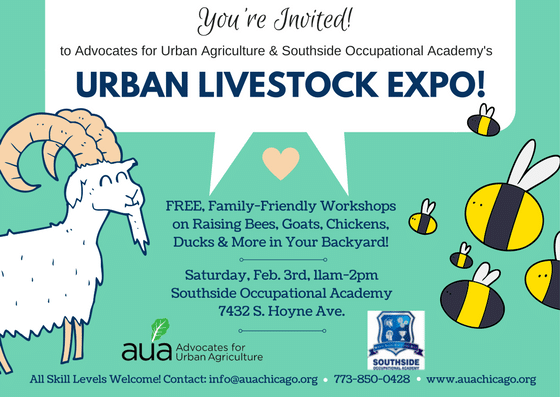 Meanwhile, AUA will continue to serve as the hub for urban agriculture in Chicago. Its 2,300+ subscriber listserv is the largest forum dedicated to urban agriculture topics in the city; free AUA organized events such as the annual Urban Livestock Expo provide inspiring, community-based educational opportunities; and resources like the Chicago Urban Agriculture Mapping Project (CUAMP) play indispensable roles connecting the local food system. The mapping project, an ongoing collaboration between AUA, NeighborSpace, DePaul University, and the Chicago Food Policy Action Council (CFPAC), is a comprehensive inventory of Chicago’s urban farms and gardens, and newly updated with a compost registration portal. AUA looks forward to supporting Chicago’s vibrant urban farming community expand opportunities and create a more sustainable food system, with urban agriculture as an integral part of community economic development, food security, environmental sustainability, and overall quality of life for all.